The Subtropical Front (STF) marking the northern boundary of the Southern Ocean has a steep gradient in sea surface temperature (SST) of approximately 4 C over 0.5 of latitude. 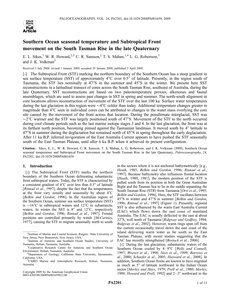 Presently, in the region south of Tasmania, the STF lies nominally at 47 S in the summer and 45 S in the winter. We present here SST reconstructions in a latitudinal transect of cores across the South Tasman Rise, southeast of Australia, during the late Quaternary. SST reconstructions are based on two paleotemperature proxies, alkenones and faunal assemblages, which are used to assess past changes in SST in spring and summer. The north-south alignment in core locations allows reconstruction of movement of the STF over the last 100 ka. Surface water temperatures during the last glaciation in this region were 4 C colder than today. Additional temperature changes greater in magnitude than 4 C seen in individual cores can be attributed to changes in the water mass overlying the core site caused by the movement of the front across that location. During the penultimate interglacial, SST was 2 C warmer and the STF was largely positioned south of 47 S. Movement of the STF to the north occurred during cool climate periods such as the last marine isotope stages 3 and 4. In the last glaciation, the front was at its farthest north position, becoming pinned against the Tasmanian landmass. It moved south by 4 latitude to 47 S in summer during the deglaciation but remained north of 45 S in spring throughout the early deglaciation. After 11 ka B.P. inferred invigoration of the East Australia Current appears to have pushed the STF seasonally south of the East Tasman Plateau, until after 6 ka B.P. when it achieved its present configuration.